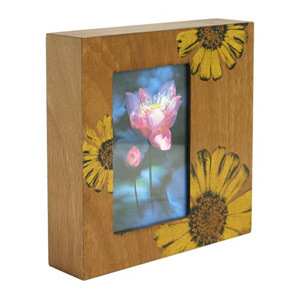 This one-of-a-kind photo frame is crafted by the wood artisans. The front is decorated with large screen sunflowers to frame a favorite photo. The frame can stand either vertically or horizontally on any tabletop. 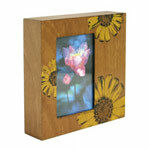 It is designed to display a standard 10 by 15 cm photo and features a glass pane for protection. Frame: 20.5 cm W x 5.0 cm H x 20.5 cm L.
Materials: Manufactured wood and glass.